Well, Makenzie is still sick! Her fever is gone but she is still super congested! Even on the decongestent, snot is coming out of everywhere! Please say an extra prayer for healing from this sickness!!!! We have a very busy week next week! My brother is getting married and all off our relatives will be in town! 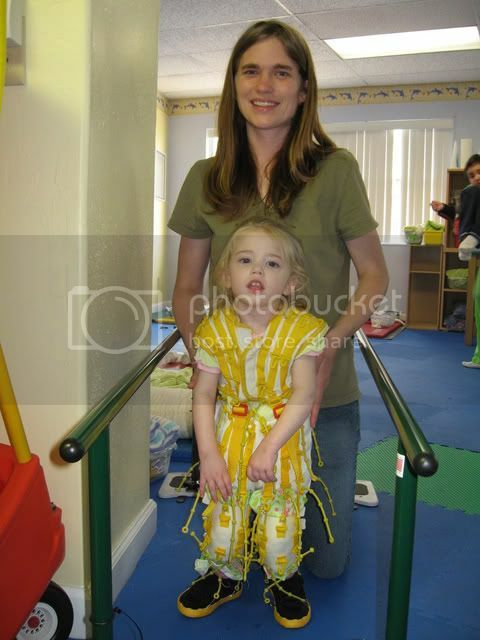 We have tons to do on top of all of her therapies and an IEP meeting for school on Monday!!! She has still been smiling and laughing which is great but overall she feels horrible! Please pray! Sorry it took so long to post. We are sare and sound back! It was a very long day but everything when very well! We flew from Ft Lauderdal to Orlando and Orlando to home. I have never had a layover any where so i was a bit worried. Everything when just fine! I want to just say again how blessed we are! This trip was not what I expected but it turned out better than I could have ever imagined!!!! I am so blessed to have so many that love and care for us walk with us down this pathway to healing!!! People that I didn't expect to and didn't have to! You all know who you are and what you have done! Thank You! It was an amazing 3 weeks!!! Here are a few more pictures of suit therapy and one of Kenzie since we have been home. She is doing so well! We are also in the process of buying a "suit" for Makenzie! I am very excited to see how it will help her! Thanks for all of the thoughts and prayers! Keep praying! Prayer Works! 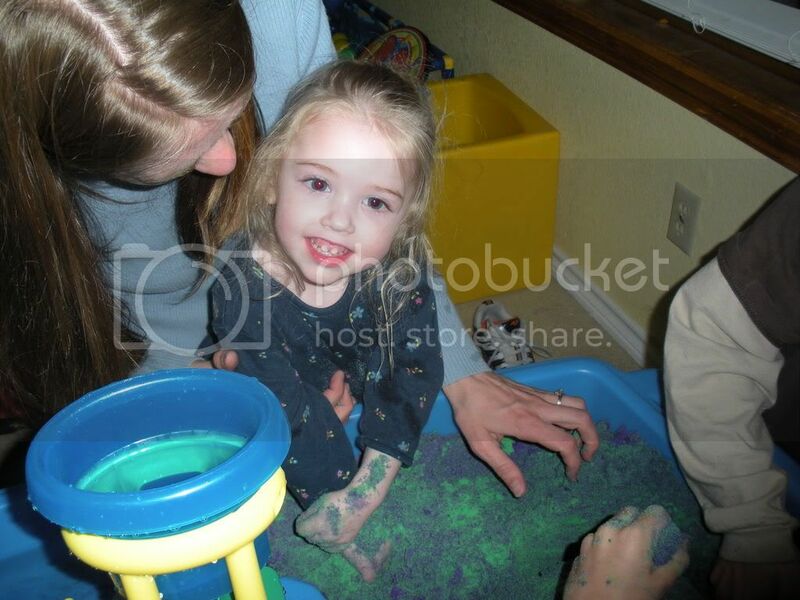 Here are a couple pictures of Makenzie on the beach this morning for therapy! I am not sure why they are so big and sideways! I resized and rotated them! Hopefully it will fix itself! She loves the beach but boy was it HOT! She did well today and seems to be feeling better. She still has a bit of a runny nose and is more fussy than normal but she is tolerating her feeds and is sleeping a lot better! Thank You all for the thoughts and prayers! I am very ready to come home and be with all of my family and friends! Please pray for strength and health to finish out the last 3 days and make it home safe and sound! Sorry about the delay in posting! Makenzie caught a cold on Friday night and has been VERY cranky!!! I took in to the ER on Friday afternoon and it is just a virus! That is good and bad. No medication will cure it so we just wait it out. She is doing much better totay but is still not tolerating her feeds. I gave her pedialite most of today and she kept that down fine so she is well hydratrated! Thank You Jesus! She seems to be very tight and a bit jumpy as well but that seems to be getting better as well. We will attemept therapy tomorrow and see how it goes! 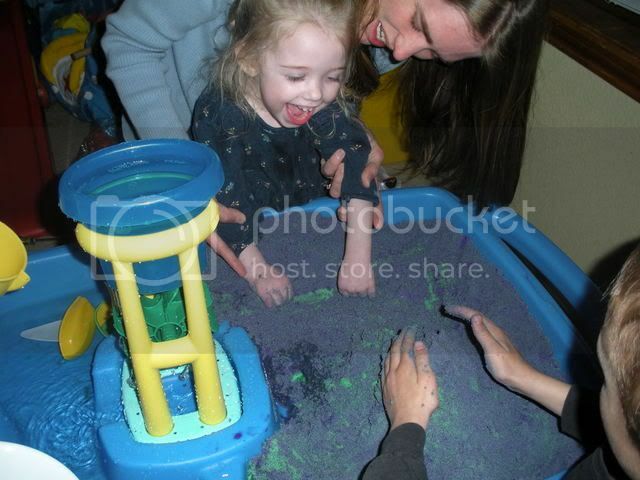 We went to church on Saturday with a family that we met at the Ronald McDonald house. It was a wonderful service. Everyone there was so kind and friendly and we learned a lot about The Jewish Christian beliefs. I am sure that I am saying that all wrong but that is the best I can do right now!!! The Rabi prayed over Makenzie and asked for healing! It was very moving and I am so greatfull!!! Thank You Donna and Matthew!!! We came home and cleaned up our room and moved out of the RMDH and into the home of a couple from a church here in Ft Lauderdale. It has been so nice to be able to sit on the couch and just relax today and also have some great company!!! It gets very lonley being away from everyone and taking care of Makenzie!!! Thank You Joyce and Ralph! Well, I am off to bed now! Gotta get some rest so we can start our last week here on a good, well rested note!!! Thank You all for your thoughts and Prayers!!! We are so blessed! Keep praying!!! Prayer Works!!! The day started out at 5:30am! We all pilled in the car and headed to the airport. After check in, security, and breakfast, Makenzie and I made our way to nearly the back of the plane and were on our way to Florida! Kenzie did great the whole way! We watched a video, played with some toys and got dressed! She did not cry one time! Then came the fun part...... getting off the plane and to the rental car by myself!!!! It was a site to see!!! I piled all 3 huge suit cases on a cart, put the gait trainer on top of the sut cases, and the car seat was left to teater on the very top! I pushed that with one hand and the stroller with Makenzie, my diaper bag, lap top, and feeding pump which was connected to Makenzie with the other!!! WOW I am sure that started a few conversations!!! Then it was time to put in all in the car!!! First the carseat... well the seat belts didn't lock so I got to figure out the handy built in locking duhickys on the carseat on the spot! Then Makenzie in the car and spent a few minutes figuring out how to work the CD player so that she could listen to her music while I shoved the rest in! 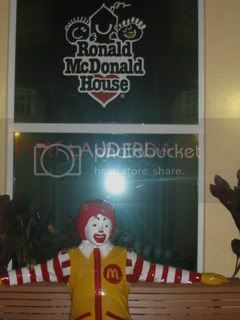 The Ronald McDonald house was very esay to find and less than 10 min from the airport. We checked in with them and then took 4 long trips tp the car to lug all of thoughs lovely suitcases up to the second floor and into our room. Mind you I am here alone so I got to carry the suitcases in one hand and Kenzie in the other! After I found my list for the store we headed off to Winn Dixie, the local grocery store to pick up the nesesary supplies that I couldn't pack and stopped by McDonald's to grab some dinner. Then we came back, I made formula, rearange the room. pluged in all of the chargers, put together Makenzie's chair and gave Makenzie a SHOWER?! There are NO bathtubs in any of the rooms here! That was interesting!!! Makenzie finaly went to sleep at about 8 pm and was pretty restless untill about 10pm. She is sleeping well now and that is so good because she is one exhausted little girl!!! Anyways, that was my day! God is so good! Even though it was a ton of work to get here, we are so blessed to be here! Thank You Jesus!!!! Tomorrow is a new day and we get to start therapy and see the OCEAN! I love the ocean! Every time I see it I feel like crying! It is so beautiful! I hope we can take a walk on the beach in the morning! Well off I go to bed! Please keep praying for healing! OK, so we are now leaving in slightly over 48 hours! I feel like there is so much to do! Getting ready for a trip like this is so overwhelming but so worth it! We spent the day doing therapy and running errands! We ordered Makenzie another pair of glasses. This pair will have transition lenses to protect her eyes from the sun. This will come in very handy in Florida! We had PT this morning and Makenzie did well. We also met a new speech therapist and she seemed very nice. We will see her again when we get back! Hopfully she has some good ideas for Makenzie's oral feeding. In her 2nd PT of the day Makenzie did wonderful! Her head control is getting so good! She did a little bit of every activity and then we got out her gait trainer and she took a couple of steps all by herself! She has figured out how to push the walker forward and then her feet get stuck underneath her. 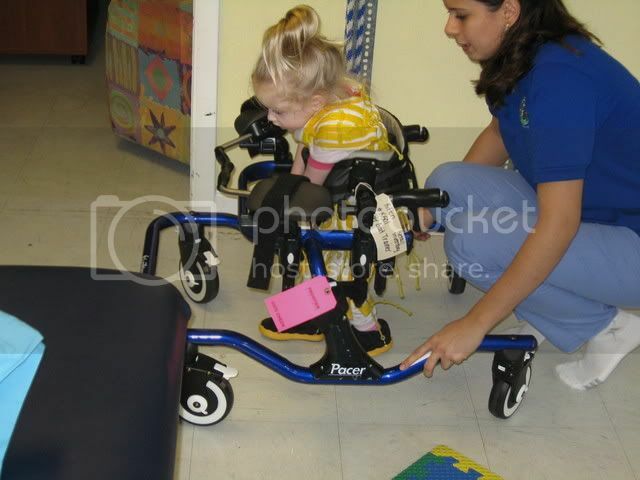 It is so cute because she will go forward and get a huge smile on her face! She totally knows the walked moved and she knows that SHE did it! Thank You Jesus! 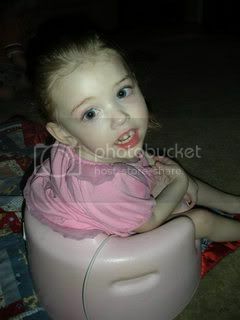 Yesterday, we spent a good part of the morning at Children's having Makenzie's Mic-Key button (feeding tube) put back in! I was taking her out of her walker and the tubing got caught on the arm rest and POP it was laying on the concrete instead of in her stomach! Oops!!!! She was such a trooper! We also had orthotics take a look at her AFO's and she has grown out of them! Go Makenzie! She has had these braces since Jan and already they are too small! So they casted her feet for new ones and they should be ready shortly after we get back! We thank you that you are a God who renews our strength by the power of your Holy Spirit. 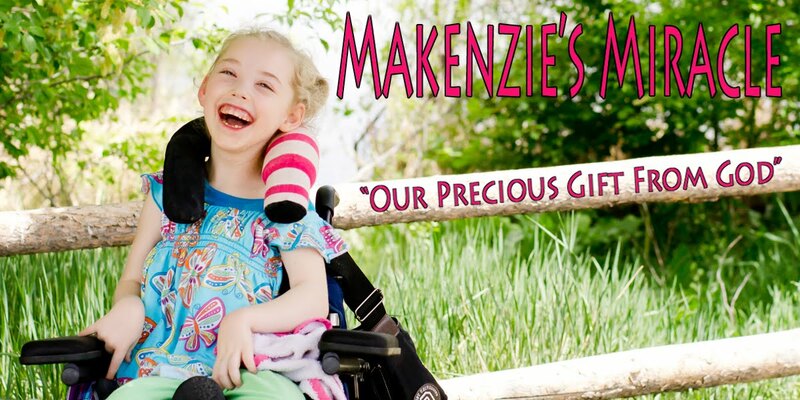 We ask that today you would renew Makenzie's strength, and that you would fall on her like rain and enable her to accomplish all she needs to today. Lord, we ask that any dry areas that are not prospering in Makenzie's life would be soaked with your refreshing rain. We also ask that you would refresh all those who work with Makenzie, that you would give them the creativity, knowledge, and insight to know how to best move her forward into all the plans you have. Thank you for all you continue to do in our lives. Thank You Jesus for all of the blessings you have graced us with! Please keep praying for our trip! Pray for safety and health! Thank you all for your thoughts and prayers!